In this lesson, we will learn how to describe the electric current induced in a wire that is placed in a changing magnetic field. 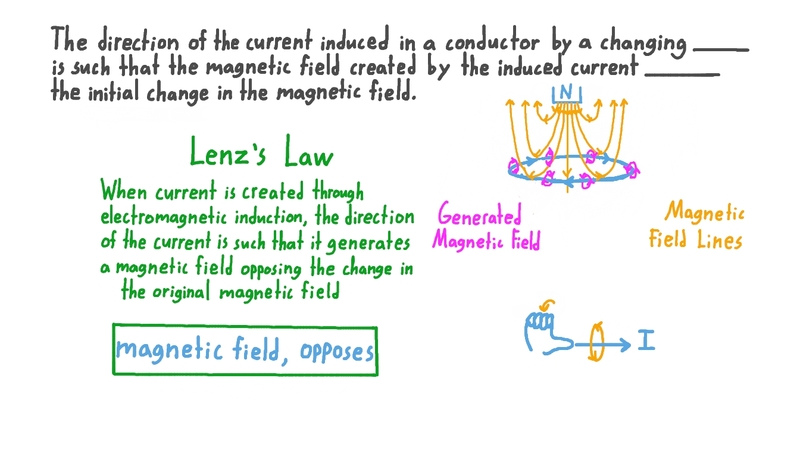 The direction of the current induced in a conductor by a changing is such that the magnetic field created by the induced current the initial changing magnetic field. The diagram shows a permanent magnet being moved through a loop of copper wire. This motion induces an electric current of 0.5 A in the wire. If the magnet is moved through the loop at half the speed, what will the current in the loop be? If the permanent magnet is changed for one that is twice as strong and moves through the loop at the original speed, what will the current in the loop be? Diagram (a) shows a straight piece of copper wire moving along a rectangular path in a uniform magnetic field. Diagram (b) shows the potential difference across the piece of wire against time as it does so. Position 𝐴 in diagram a corresponds to the section marked 𝑃 in diagram (b). Which section of diagram (b) does position 𝐶 in diagram (a) correspond to? Which position in diagram (a) does section 𝑆 in diagram (b) correspond to? The diagram shows a permanent magnet being moved through a loop of copper wire. This motion induces an electric current in the wire. Which of the following correctly describes how the current within the wire can be increased? AThe current in the wire can be increased by moving the magnet through the loop faster. BThe current in the wire can be increased by increasing the thickness of the wire. CThe current in the wire can be increased by reversing the direction of the motion of the magnet while keeping the wire in the same position. DThe current in the wire can be increased by increasing the radius of the wire loop. EThe current in the wire can be increased by moving the wire at the same speed and in the same direction as the magnet. Which of the following correctly describes how the current within the wire can be reversed? AThe current in the wire can be reversed by reversing the direction of motion of the magnet while keeping the wire in the same position. BThe current in the wire can be reversed by moving the wire at the same speed and in the same direction as the magnet. CThe current in the wire can be reversed by moving the magnet through the loop faster. DThe current in the wire can be reversed by moving the magnet past the outside of the wire loop. EThe current in the wire can be reversed by rotating the loop about its axis as the magnet passes through it. What would be the effect of keeping the magnet still and moving the loop of wire toward it so that the magnet passes through it? AThe current in the wire would be reversed. BThe same current would be induced in the wire. CThe current in the wire would be zero. What would be the effect of turning the magnet around so that the south pole of the magnet goes through the loop first? AThe same current would be induced in the wire. BThe current would be reversed. Diagram (a) shows a straight piece of copper wire moving along a circular path in a uniform magnetic field. Diagram (b) shows the potential difference across the piece of wire against time as it does so. If point 𝐴 in diagram (a) corresponds to point 𝑃 in diagram (b), what point in diagram (a) does point 𝑅 in diagram (b) correspond to? Parts (a), (b), (c), and (d) of the diagram show a straight piece of copper wire moving through a magnetic field. The magnetic field is uniform and, in each part, the wire is moving at the same speed but in a different direction through the magnetic field. Which of (a), (b), (c), and (d) shows a motion of the wire that would lead to an electric potential difference being induced in the wire? Parts (a), (b), (c), and (d) in the diagram show a straight piece of copper wire moving through a magnetic field. The magnetic field is uniform, and in each part the wire is moving at the same speed, but in a different direction through the magnetic field. Which of (a), (b), (c), and (d) shows the motion of the wire that would lead to the greatest potential difference being induced in it? Parts (a), (b), (c), and (d) in the diagram show a straight piece of copper wire moving through a magnetic field. The magnetic field is uniform, and in each part the wire is moving in a different direction through the magnetic field. Which of (a), (b), (c), and (d) show a motion of the wire that would lead to an electric potential difference being induced in it?